HJ: Balancing our chakras is not complicated or difficult. It simply requires a little effort and intention towards doing so. One of the most pleasurable ways to do so, in my experience, has been through the use of heart opening yoga postures. These simple, but powerful yoga poses simultaneously stretch tense muscles and balance and open our heart chakra. By combining the postures with focused intention and breath, we can greatly amplify the effects of these exercises. Practiced regularly, we can quickly and rapidly elevate our consciousness and heal energetic imbalances in our system. Furthermore, these exercises kindle within us our ability to heal ourselves. They teach us to identify and work with our own subtle energies, which in the long run, is priceless and how the deepest, most profound healing occurs. This is a fantastic article that gives great background information and a solid foundation to begin working with the heart chakra both through yoga and various other healing modalities. Everyone wants to love and be loved. That very human desire creates an immediate and deep connection with Anahata, the heart chakra. The fourth of the energy wheels stacked from the pelvic floor to the crown, the heart chakra sits in a pivotal position in your body. Not only is it located at center of your physical heart, it also marks the transition from the lower three chakras (which are associated with relationships to the society around you, your loved ones and yourself) to the higher chakras that relate to enlightenment and to connection with the Divine.Anahata is the bridge between the earthly and the eternal. Both the physical heart and the heart center are vital. And they both need nurturing. Asana practice, breath work and a healthful diet support the functioning of your physical heart. They also make the work of your physical heart easier by improving your circulatory and respiratory systems. Meditation enhances the health of the spiritual heart center. It opens the channels of understanding that enable you to look at your thoughts, words and actions within the context of unconditional love. As you learn more about Anahata, you will see how to take its various aspects into your daily life. You may want to wear or carry its gem as a reminder to keep your heart center free. Incorporating its sound into practice can intensify your intention. Maybe just using a green yoga mat or wearing green will signal your connection to your heart center. What follows is a starting point for the possibilities. Physical associations: Heart, circulatory system, lungs, chest, arm, shoulders. It is also associated with the thymus gland. In balance: The physical heart is functioning optimally and the heart center is in a state of selfless love and compassion. Physical imbalances: Heart issues, lung and breathing problems, upper back pain, breast cancer, compromised immune system, blood diseases. Emotional imbalance: anger, revenge-seeking, grief, bitterness, meanness. Meditation. This is based on a meditation given by Swami Sivajnanananda. Sit in a comfortable position. Focus your attention in front of your heart near your breastbone. Allow yourself to sense the rhythm of the beating of your heart. Sync your breath with the beating of your heart, noticing the expansion and contraction of your cage. Try to visualize the breath moving out from your heart into your lungs. Then see your breath traveling from the trigger point in front of your heart toward the heart chakra point along your spine. Visualize the air as it exits from the points on the spine out through the trigger point. Let your breath become subtler. Concentrate on the rhythm of your inhales from the trigger point to the chakra point on the spine and exhales from the spine to the trigger point. Try to see both points in your mind. In your mind, add the chant of Om to your inhales and exhales until this fills your concentration. Allow your mind and body to relax. Sukh-Purvak Pranayama (Complete Joy Breath) Benefits: This breathing exercise calms and cools, allowing you to be more open in your heart. How to do it: Begin in Sukhasana (Easy Pose) or Padmanasana (Lotus Pose). Close your right nostril with your right thumb. Inhale through the left nostril for three Oms. Then use the little finger of your right hand to close your left nostril. Hold your breath for six Oms. Then release your right thumb and exhale for six Oms. Repeat on the other side. Benefits: This gentle backbend opens your chest, helping you to feel the receptiveness associated with the heart chakra. How to do it: Lie on your stomach with your legs extended behind you. Rotate your thighs inward. Place your elbows next to your shoulders and your forearms parallel to each other. On an inhale, keep lengthening through your tailbone as you lift your head and torso off the floor. Lightly draw your belly away from the floor, rounding it toward your lower back. Stay for five to 10 breaths, then release. Repeat one to two more times if you like. Benefits: This heart-opening pose stretches the muscles of your chest. How to do it: Begin on your knees with your legs hip-width apart. Place your hands on the back of your pelvis. Without compressing your lower back, lean back into the support of your hands. If it is available to you, move into the full pose by clasping your ankles with your hands. Focus on lifting your pelvis so your hips don’t “pop” forward. Keep your neck long or look back. Remain in the pose for 30 seconds to one minute. Release by bringing your body gently back to a kneeling position, then rest for a few breaths in Balasana (Child’s Pose). Benefits: This arching pose helps to soften and release tense muscles in the neck and back that keep you from letting your heart open. How to do it: Start on your hands and knees with your hands under your shoulders and your knees under your hips. Gently lift your back into an arch and release your gaze downward. Benefits: This deep backbend opens the intercostals muscles between the ribs, creating more physical space in your heart center. How to do it: Begin on your back with your knees bent and your feet on the floor. If you are experienced in the pose, you can bring your legs into Padmanasana (Lotus Pose). Either way, inhale, lift your hips slight and place your hands, palms down, under your hips. Lower your pelvis onto your hands. Inhale and press into your elbows and forearms to lift your upper back and gently place the crown of your head on the floor. Be careful not to let your head take too much weight. Remain in the pose for 15 to 30 seconds before releasing and hugging your knees into your chest. 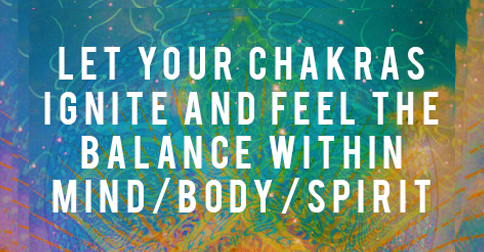 Benefits: Drawing attention to your breath and the muscles of the upper body helps to activate and balance the heart chakra. How to do it: Sit in Sukhasana (Easy Pose). Bring your arms out to the side, palms down. As you exhale bring your arms forward until they almost meet. On an inhale, bring your arms back to the side. Find a comfortable rhythm and continue for one to five minutes. Just taking a deep breath, concentrating on breathing in love, then taking an exhale to let go of anything that burdens your physical heart or heart center makes you feel lighter, more optimistic. You’ll be more ready to accept connection with yourself and people who truly love you. You’ll be free of the weight that anger and jealousy bring to your heart. That makes room for your heart and heart center to grow and thrive.